At that time the town was chiefly an agricultural centre for the surrounding district, and "great quantities of oats, barley, salt butter, and pultry of all kinds" were sent from it to Bristol. In the Directory Welsh names largely prevail: e.g. out of 127 traders 79 had Welsh names; in the professions of law and physic fout out of the five names were Welsh, though under gentry there were only three Welsh names out of nine. 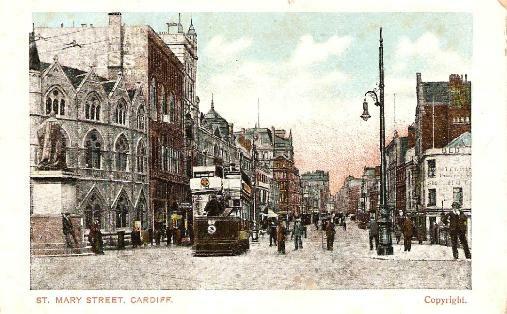 "that early in the 19th century Cardiff was a bilingual town, that English was freely used and understood by most of the inhabitants, but that a large amount of Welsh was spoken, particularly in the houses, and that, so far as Cardiff was a centre for markets and fairs, it was almost exclusively a Welsh centre." Rhys, John and Brynmor-Jones, David (1906) The Welsh People, 4th edition, T. Fisher Unwin.